Another Liam Neeson thriller involving threatened family members, The Commuter could have been tired and shopworn. Instead, it feels, if not fresh, sometimes surprising, and it's vigorous enough to satisfy most action and mystery fans. 3.5 out of 5. Sixty years old and suddenly unemployed, insurance salesman Michael MacCauley (Neeson) just wants to get home. He takes the same commuter train to and from work every day and recognizes most of the regular riders. That makes him an ideal target for an unfamiliar woman (Vera Farmiga) who approaches him with an offer: Agree to find an individual on the train who "doesn't belong" and leave the person to a nasty fate. Payment will be $100,000. Opting to not do it—well, that's not an option. Not if MacCauley wants to see his family again. It helps that MacCauley is an ex-cop who can call on former colleagues like Alex Murphy (Patrick Wilson) to get him out of the jam. Or so MacCauley thinks. Soon he's working to save not only the life of the villain's target aboard the train, but his own. Director Jaume Collet-Sera has worked with Neeson on three earlier films (Unknown, Non-Stop and Run All Night), and the fruits of working together repeatedly must be paying off. This is a stylish, well-directed thriller that moves. Neeson can still turn into an action machine when needed, but the film is most notable for the way Neeson's character is framed, especially early, as he realizes the inescapability of the moral dilemma he faces. Collet-Sera pulls out a few camera tricks to reflect MacCauley's inner turmoil and to create a greater sense of movement and action within the confines of a train. It works. The Commuter is far from perfect. It feels several minutes too long, and too many of its supporting characters are disposable. But even if these Liam Neeson thrillers seem overly familiar, The Commuter injects enough life into the formula to make the investment of time relatively painless, and sometimes downright enjoyable. The Commuter doesn't have much to say in the realm of faith. MacCauley is desperate to protect his family when threats are made against them, of course, but he doesn't say anything profound. He's mostly a man of action, and the story's central "game" puts McCauley in an ethical dilemma in which he's forced to protect himself and his family by jeopardizing others. Attempts at meaningful dialogue come across as cynical, as when a passenger expresses his philosophy about life, saying, "One day, it's done with you," and when another character calls the world "corrupt." There's also a comparison to "the seventh circle of Hell," and a character who says, "Doing the right thing will get you killed" and, "There's no such thing as being noble." The most direct mention of God is a flippant remark, "If you want to know what God thinks about money, look at who He gives it to." Language/Profanity: Lord's name taken in vain; the f-word; "a-shole"; "p-ick"; "bul-sh-t"; "scumbag"; "hell". 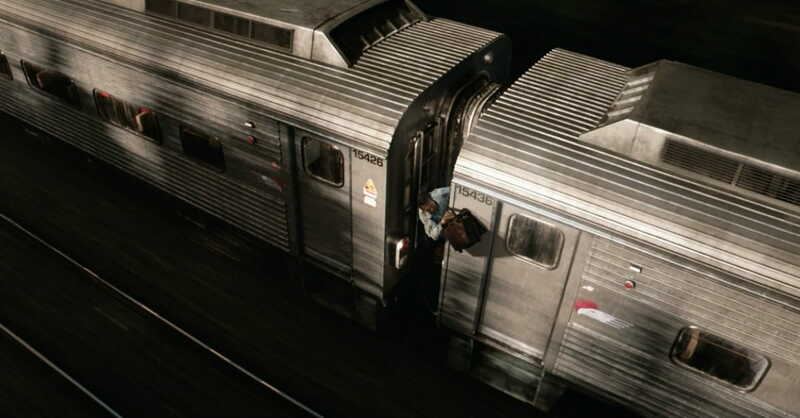 Violence/Frightening/Intense: Death threats; a man is pushed in front of a bus and killed; gunfire; fighting; a corpse with a head wound is seen, and McCauley ends up confined with the corpse temporarily; a man is sprayed in the face with an unknown substance; near misses involving oncoming trains; a derailment; another dead body is seen. RECOMMENDED FOR: Viewers who enjoy sleek action filmmaking that moves quickly enough to keep plausibility questions (mostly) at bay while you're watching. NOT RECOMMENDED FOR: Like many action blockbusters, this one won't hold up to close scrutiny, so if plot holes drive you crazy, you might want to stay home rather than get on board. The Commuter, directed by Jaume Collet-Sera, opens in theaters January 12, 2017. It runs 104 minutes and stars Liam Neeson, Vera Farmiga, Patrick Wilson, Sam Neill and Elizabeth McGovern. Watch the trailer for The Commuter here. EDITOR'S NOTE: After more than a decade of reviewing movies at Crosswalk, this is Christian Hamaker's final review for the site. He wishes to extend his gratitude to Crosswalk, his editors, and to all his readers over the years - both those who agreed with his reviews and those who argued with him. He's looking forward to providing faith-informed movie criticism on other platforms in the future.